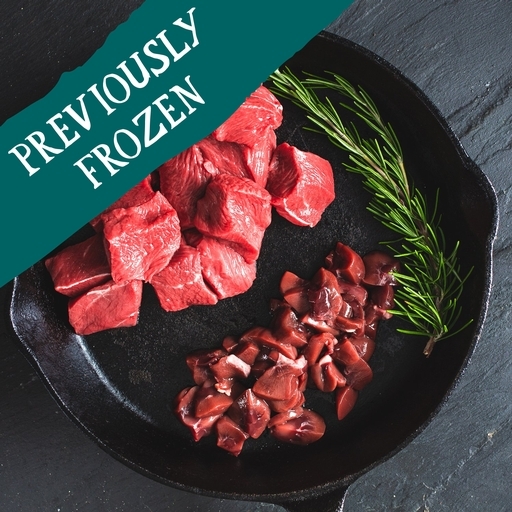 A pack of fresh steak and kidney from organic grass-fed beef in just the right proportions to make your own steak and kidney pie or pudding. No prep needed, full of flavour and low on fuss. You can even slow cook the mix ahead of time, then freeze and defrost when we’re ready to finish the pie. Serves 4. Toss in seasoned flour, then brown quickly in a pan on the hob. Cook gently for an hour with a glass of red wine, 250ml stock, 100g mushrooms, a sliced onion, bouquet garni and a little English mustard and tomato ketchup. Top with suet, puff or shortcrust pastry and bake for 30 mins. Alternatively, try a traditional steamed pudding, or use in a casserole – dumplings essential. Keep in the fridge below 5˚C. The kidneys have been pre-frozen, so do not refreeze.